They're back! The industry’s biggest annual survey originating from the Netherlands specifically targeting SBC and VDI has started again after a fallow year. Since the last Project VRC State of the SBC/VDI Union survey in 2015, many discussions in the End User Computing, VDI and SBC space are not just about performance best practices and product comparisons. With so many VDI and SBC deployments out there, the differences are huge. It is only logical to wonder how real-world VDI and SBC environments are used and how they are built, especially when you consider the rapidly changing VDI/SBC landscape. Since it’s driven as much by innovation as it is by marketing campaigns, there is a clear need to better understand what is out there. The goal of the survey executed by Ruben Spruijt, CTO Atlantis Computing, and Mark Plettenberg, PM LoginVSI, is to share insights about usage, configuration and trends in the Virtual Desktop Infrastructure and Server Based Computing industry. The ‘State of the VDI and SBC union’ survey responses will be strictly confidential and data from this research will be reported only in the aggregate. The results will be reported in a whitepaper that is free to download after registration. If that's not enough the team are also giving away three (3) Amazon gift cards ($50) to randomly selected full survey completers. The questions are comprehensive, and relevant to everyone building on-premises VDI and SBC, Desktop as a Service Cloud environments. The aim of the VDI Like a Pro movement is to repeat the survey at least once a year. This will allow professionals to see how the industry is changing in practice. The amount and quality of the responses will determine the success of the survey. VDI like a Pro will present and publish the findings of the survey publicly, but the full report with all results will be made available only for the survey participants first. So, if you participate you get first hand access and make this community effort a success. Back in October, Citrix asked for proposals to be a guest speaker at Citrix Synergy 2015, in Orlando May 12–14. Guest presenters are one of the highlights of Synergy every year. Citrix Synergy events have featured speakers represent a range of industries including healthcare and education, consulting and financial services, and some of the world’s largest IT companies. This year Citrix believe they have an incredible lineup of IT professionals and industry thought leaders to share their perspectives, their toughest challenges, and their real-world solutions with you at Synergy. Which includes me and my colleague Jim Moyle larking around talking about Manage IT All – ScaleXtreme in action with slides, demos and, very likely because Jim likes them a lot, graphs. We saw ScaleXtreme back end of 2014 when just after the Citrix's acquisition of the company. ScaleXtreme was innovative technology to manage the lifecycle of enterprise applications and infrastructure across virtualization and cloud environments as a software service. Very Interesting. Let's have a look at that we thought to ourselves. We've had some great interaction with the product management team - have been bowled over by the change in the product and what is being offered/proposed in terms of services for lifecycle management as a service. We're looking forward to passing what we know on. Again, a big thank you to everyone who joined us live or listened online for the first episode of the End User Computing Podcast. If you missed it, you can click here to listen to our first episode online or subscribe. 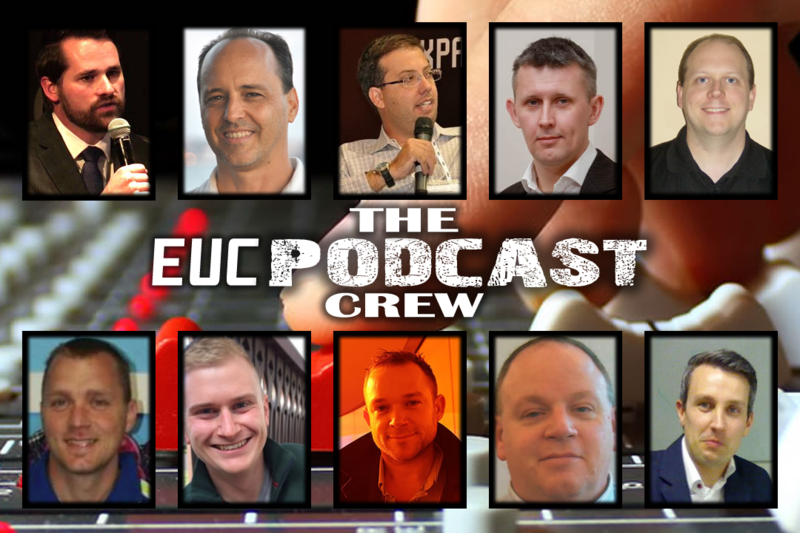 We are excited to announce the second episode of the EUC Podcast will be streamed live with a tweet chat on Monday March 16th at 22:00 GMT. This episode will be available via iTunes and other RSS/Podcast applications on iOS, Android, Windows, Mac, etc. To subscribe, go to http://eucpodcast.com/subscribe/ To participate in the live stream and tweet chat, go to www.eucpodcast.com during the live stream. We will be interacting via Twitter hashtag #EUCPodcast with an embedded Crowd Chat: https://www.crowdchat.net/EUCPodcast Click here to add this event to your calendar (Download .ICS file). As part of the podcast, we will be doing introductions, talking about news and announcements, and introducing a segment called Ask the EUC Experts where audience and community members have an opportunity to submit questions or podcast topics via the web form. If you have any comments, questions, or want to learn more, feel free to use the comments section below to leave us your feedback. We look forward to talking with you on Monday the 16th at 22:00 GMT.. yes.. that's 22:00. BYOC - Bring your own Coffee. While at the London VMUG this week, I attended Mike Laverick's well time kept session on the excitement that is a career in IT - specifically focused around the need to keeping skills fresh. A career in IT can be a job for life, but very likely not in the same role, or company. In his overview for Tech Ed Europe 2014 Aidan Finn talked about how traditional learning mechanisms can no longer keep up with sprint development, new features out every few weeks, and RTMs every 12-18 months. I'd agree with Aidan that conferences (and user group meetings) can give you a valuable and focused time to get to grips with new technologies, understand trends and discuss these with your peers for review and extra insight.